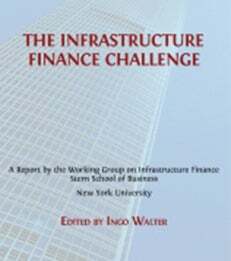 The NYU Stern School of Business presents an eBook, The Infrastructure Finance Challenge, authored by a team of faculty members at Stern. Infrastructure and its effects on economic growth, social welfare, and sustainability receive a great deal of attention today. There is widespread agreement that infrastructure is a key dimension of global development and that its impact reaches deep into the broader economy with important and multifaceted implications for social progress. At the same time, infrastructure finance is among the most complex and challenging areas in the global financial architecture. Ingo Walter, Professor Emeritus of Finance, Corporate Governance and Ethics at Stern and his team of experts tackle the issue by focussing on key findings backed by serious theoretical and empirical research. The result is a set of viable guideposts for researchers, policy-makers, students and anybody interested in the varied challenges of the contemporary economy. To learn more about the eBook, visit Open Book Publishers.